Just days after adding new members to its board, Deutsche Bank replaced CEO John Cryan and named Christian Sewing, who co-led the private and commercial bank, to take over. Deutsche Bank AG (DB - Get Report) , Germany's largest lender, shook up top management on Sunday, replacing CEO John Cryan after three straight years of net losses totaling more than $10 billion and an ongoing erosion of market share in its once-dominant investment-banking and trading unit. Co-President Christian Sewing, who oversaw the Frankfurt-based company's private and commercial bank, will become CEO, while fellow Co-President Marcus Schenck will depart later this year, Deutsche Bank said in a statement. Sewing, who turns 48 this year, has worked at Frankfurt-based Deutsche Bank since 1989, with prior stints in auditing and risk-management in such places as London, Singapore, Tokyo and Toronto. Cryan, a decade older, took over as sole CEO in 2016 after an earlier career at the Swiss bank UBS AG. He immediately confronted a slew of inherited troubles, including persistently low interest rates that cut into lending margins and outsized legal costs over mortgage-related misdeeds in the U.S. Then last year, amid promises of improvement, unusually low volatility in global financial markets kept Deutsche Bank's investor customers on the sidelines, reducing pre-tax profit in the investment-banking and trading business by more than half. In the statement, Paul Achleitner, a former executive of the Wall Street firm Goldman Sachs Group Inc. (GS - Get Report) who took over as chairman of Deutsche Bank's board in 2012, thanked Cryan for his service but noted the need for change at the top. Cryan will stay on through the end of this month. Goldman Sachs is a holding in Action Alerts Plus. "Following a comprehensive analysis we came to the conclusion that we need a new execution dynamic in the leadership of our bank," Achleitner said in the statement. Deutsche Bank shares have tumbled 27% in the past year, even as global rivals JPMorgan Chase & Co. (JPM - Get Report) , Bank of America Corp. (BAC - Get Report) and Citigroup Inc. (C - Get Report) have posted big rallies. The management changes came just days after Deutsche Bank added four new members to its board, including Mayree Clark, a former executive of the Wall Street firm Morgan Stanley, and John Thain, another former Goldman Sachs executive who subsequently served as CEO of the New York Stock Exchange, Merrill Lynch and CIT Group Inc. (CIT - Get Report) . 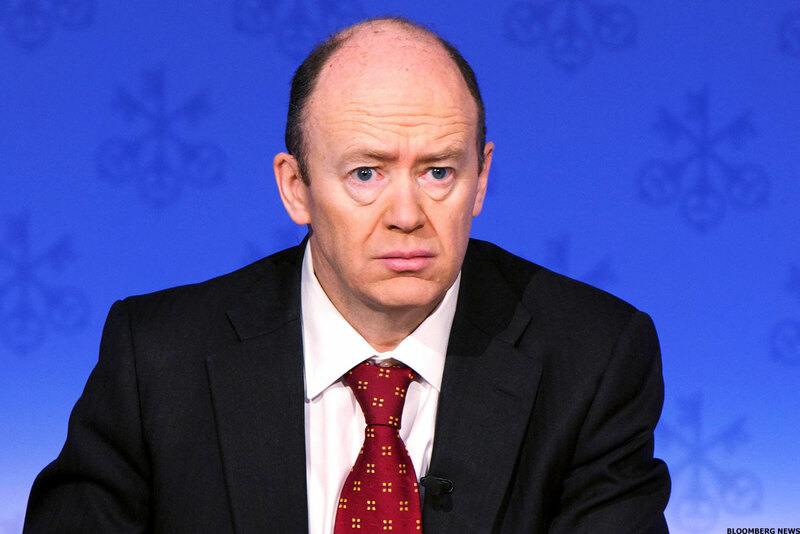 Outgoing Deutsche Bank CEO John Cryan. A big problem is that Deutsche Bank simply isn't very profitable. The bank produced a pre-tax profit of 1.3 billion euros ($1.6 billion) last year; for comparison, New York-based Citigroup, which has roughly the same level of assets, reported pre-tax profit that was 14 times higher, at $22.8 billion. And, based on estimates from stock analysts at RBC Capital Markets, Deutsche Bank isn't faring much better so far in 2018. In the first-quarter, Deutsche Bank's revenue from trading stocks and bonds probably fell 11% from a year earlier, according to RBC, the most among nine global investment banks. Revenue also likely tumbled 21% in the usually-lucrative business of underwriting stocks and bonds and advising on mergers, RBC estimated. Deutsche Bank didn't detail any specific strategy changes in the statement. But David Hendler, an analyst at Viola Risk Advisors in Montebello, New York, says the company needs to undergo a drastic restructuring to win back investors' confidence. Cryan's main strategy had been to cut costs and resolve the legacy troubles, such as the mortgage-related legal costs, according to Hendler. Even so, the bank earlier this year had to raise its estimate for 2018 costs by 4.5% to 23 billion euros, due to the delay or suspension of planned business disposals. In February, the bank hatched a plan to fire 250 to 500 employees in its trading and investment-banking division -- just weeks before annual bonuses were paid out -- to save money that could be paid out to top performers. Cryan told investors that cost-cutting was a "critical component of improved and sustained profitability," after saying last year that the bank was "investing in people." The bank is plagued with outmoded, multiple computer systems that have been stitched together over the years and don't operate seamlessly, Hendler said. And it's had to rein in risk-taking in the trading business - a significant source of profitability in prior years - to satisfy increasingly stringent rules imposed by regulators. "Cryan did all these moves to reduce expenses because revenues were plummeting, and raising external capital because they can't earn capital themselves," Hendler said. "The core operating income is de minimus." For a restructuring, one possibility could be for Deutsche Bank to significantly curtail its global ambitions in trading and investment-banking and concentrate on its strength as a European-focused corporate lender and brokerage firm, Hendler said. But even that strategy could do little to revive the bank's fortunes because many of the biggest European companies can easily raise cheap financing in global bond markets. And retail banking isn't a thriving business in Germany due to the historically spendthrift ways of consumers there. "People in Germany don't spend more than they make," Hendler said. "If you ask Deutsche Bank where can they grow, they don't have a lot of answers." A more draconian option would be a major financial restructuring -- possibly assisted by the German government -- where debt is converted into equity, giving bondholders control of the company and mostly wiping out existing shareholders. That option might face resistance from regulators worried that such a move could spook markets and trigger panic among investors and depositors at other European lenders. "They need some merger with someone that's government sponsored to get them more diversified, with a chance of succeeding," Hendler said.